This book offers a novel and proven approach to the retention and success of underrepresented students. It advocates a strategic approach through which an institution sets clear goals and metrics and integrates the identity support work of cultural / diversity centers with skill building through cohort activities, enabling students to successfully navigate college, graduate on time and transition to the world of work. Underlying the process is an intersectional and identity-conscious, rather than identity-centered, framework that addresses the complexity of students’ assets and needs as they encounter the unfamiliar terrain of college. In the current landscape of higher education, colleges and universities normally divide their efforts between departments and programs that explicitly work on developing students’ identities and separate departments or programs that work on retaining and graduating higher-risk students. This book contends that the gap between cultural/diversity centers and institutional retention efforts is both a missed opportunity and one that perpetuates the opportunity gap between students of color and low-income students and their peers. Identity-consciousness, the central framework of this book, differs from an identity-centric approach where the identity itself is the focus of the intervention. For example, a Latino men’s program can be developed as an identity-centered initiative if the outcomes of the program are all tied to a deeper or more complex understanding of one’s Latino-ness and/or masculinity. Alternately, this same program can be an identity-conscious student success program if it is designed from the ground up with the students’ racial and gender identities in mind, but the intended outcomes are tied to student success, such as term-to-term credit completion, yearly persistence, engagement in high-impact practices, or timely graduation. Following the introductory chapter focused on framing how we understand risk and success in the academy, the remaining chapters present programmatic interventions that have been tested and found effective for students of color, working class college students, and first-generation students. Each chapter opens with a student story to frame the problem, outlines the key research that informs the program, and offers sufficient descriptive information for staff or faculty considering implementing a similar identity-conscious intervention on their campus. The chapters conclude with a discussion of assessment, and suggested “Action Items” as starting points. 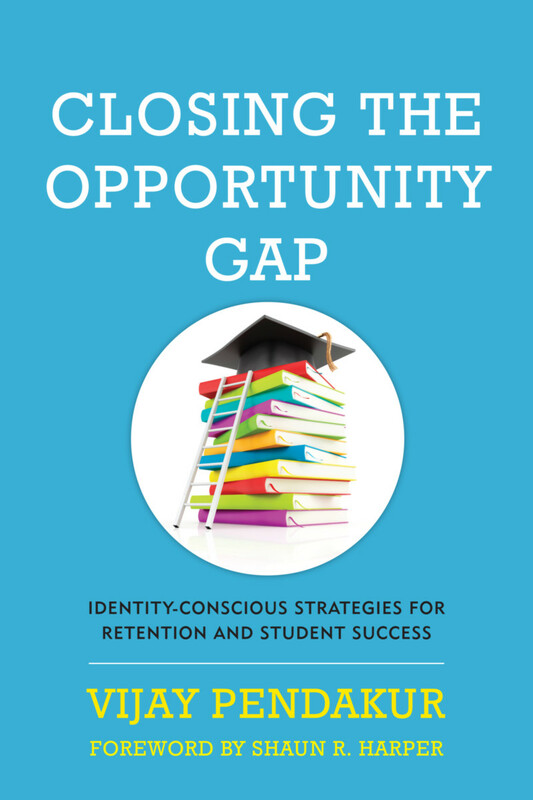 "Vijay Pendakur's edited volume Closing the Opportunity Gap: Identity-conscious Strategies For Retention and Student Success is written for university staff members who focus on the academic success of low income students and students of color. It is not a scholarly volume aimed at academics, but more of a how-to guide. It consists of eight chapters written by practitioners, so do not look for theory or many references to research on this topic. “This timely book explores retention strategies in a novel and critical way. Focused on identity conscious strategies, this book rethinks retention strategies for the diverse student populations on campus and the identity dimensions they bring. To address the equity imperative in college completion we must rethink who our students are and what identities they carry and how that shapes their educational experience. This volume provides the playbook to guide us in planning and programming for student success in an identity-conscious way. “Guided by an inclusive and positive vision, the chapters recommend new approaches to identity-conscious programming that can be woven across the institution—integrative and collaborative evidence-based practices toward outcomes any institution can achieve. The collection offers silo-busting advice on ways to address the opportunity gap and help new majority students thrive." Vijay Pendakur Dr. Vijay Pendakur serves as an Associate Vice President for Student Affairs at California State University – Fullerton. Prior to joining Cal State Fullerton, Dr. Pendakur served as the Director for the Office of Multicultural Student Success, a department charged with increasing the retention and persistence of low-income students, first generation students, and students of color at DePaul University in Chicago. He holds a bachelor's degree in history and East Asian studies from the University of Wisconsin, Madison, a master's degree in U.S. history from the University of California, San Diego, and a doctorate in education from DePaul University.